Some great feature articles and interviews have passed through Sight already, and here you can find some of them preserved. In October last year, seven-year-old Allan Ssembatya was walking home from school with friends when he was kidnapped. A frantic search followed before he was found, whimpering, under a bush, laying in a pool of his own blood. He had suffered injuries that can only be described as horrific – an axe had torn open his skull and a section removed. He had been stabbed in the neck and had been castrated. Allan, who lives in the Kayunga District of Uganda - just to the north of the capital of Kampala, is one of the many children taken each year by people looking for children to sacrifice to their gods. Thankfully Allan survived his wounds – although a stroke caused as a result of the horrific attack has left him with epilepsy and weakness and numbness in one arm – but many don’t. One organisation attempting to tackle the rising problem is Uganda-based Kyampisi Childcare Ministries (KCM) which aims to help vulnerable children. Its data, based on police information, shows that the numbers of children believed to have been killed or disappeared as a result of child sacrifice are growing. "(Within the church) I don’t think there’s an apathy in trying to work hard or build something or make something work but I think that when it comes to really trusting Jesus, for some reason we have just kind of subtly fallen into the belief that Christ alone is not sufficient; that we need Christ plus other things to help us or we’re not going to get it done; that God alone is not going to be enough to reach this culture. I’m in my forties but I’m finding guys younger than me are really trying to find some kind of method or program or strategy that will help them become the next Hillsong or something like that. God’s not always trying to build a Hillsong or a Times Square church, sometimes He wants the church to be 200 people that are really serving the community faithfully and reaching prisoners or homeless kids. God is very creative and has different callings on different lives." The African economy is drained of as much as $US18 billion very year thanks to armed conflicts with as much as $US284 billion lost over the 15 years to 2005, according to new research released by Oxfam this week. The report - Africa’s Missing Billions - found that, on average, a war, civil war or insurgency shrinks an African economy by 15 per cent. “Armed violence is one of the greatest threats to development in Africa,” said Irungu Houghton, African policy advisor at Oxfam, who conducted the research with the backing of non-government organisations International Action Network on Small Arms and Saferworld. “The costs are shocking”. WHAT WAS THE HIGHLIGHT OF THE JESUS PRO-AM? Pete Hunt is the media contact for the Christian Surfers competition, the Jesus Pro Am. "There were many highlights of this year’s Jesus Pro Am: the incredible surfing, the great weather and waves that God blessed the event with (despite the forecast), the inspiring work of all the Christian Surfers crew and local church members, and more. However, probably the biggest highlight of the Jesus Pro Am for me was witnessing the name of Jesus proclaimed so boldly at my local beach, Cronulla. Cronulla is a very secular place at the best of times and to see even the ‘Jesus Pro Am’ banner or the Christian Surfers logos on the many tents at the event is a great thing. But the event went further. There was the win-a-surfboard competition, where entrants had to look up various verses from the Surfers Bible and then answer important questions about who the Bible says Jesus is and then who they thought he is. There were also the event commentators, who on regular occasions during their commentary explained to all within reach of the loud speakers who Jesus is and what He means to us as Christians. There was also the church service in the park behind the beach held on the Sunday by the Beachside Vineyard Christian Fellowship. And finally there was the Gospel presentation given by ‘Mousey’ during the presentation at the conclusion of the event, where the strong crowd of locals and competitors heard who Jesus is and what He has done for them through His death and resurrection. The Jesus Pro Am was truly a blessing for Cronulla." For more information on Christian Surfers or the Jesus Pro Am, visit www.christiansurfers.org.au. I hear from God when...I am alert to the possibility that God can and does speak at any time through scripture, experience, circumstance, worship, creation, or the person (people) I happen to be with at the time. Like all atheists, Richard Dawkins does not understand the concept of God and why God exists. He has been told this before, as he writes in his book, The God Delusion: "This is as good a moment as any to forestall an inevitable retort to the book, one that would otherwise - as sure as night follows day - turn up in a review: ‘The God that Dawkins doesn’t believe in is a God that I don’t believe in either. I don‘t believe in an old man in the sky with a long white beard. '...I am attacking God, all gods, anything and everything supernatural, wherever and whenever they have been or will be invented." Dawkins is an atheist because he places too much confidence in the methods and ideas of science. Working scientists are just people living their lives in a practical and reasonable manner. If something unusual occurs in the lab, scientists assumes there is a reason and try to replicate what happened. This is the same kind of common sense and reason mothers use when they assume there has been no change in the number of children they have when they are out shopping. News that criminals are buying personal identities for around $1 should come as no great surprise. In an age where almost everything from cash to family contact is being digitised, it's not hard to see huge opportunities for scams large and small. According to a new study on internet security, fraudsters can now buy your credit card details, your name, address and date of birth for less than the cost of a can of coke. Data collected from over 200 countries showed 349.6 billion spam messages were sent in 2008, a 192 per cent increase on the previous year. In the midst of all this, more and more people are handing over details of their identities to criminals, via phishing websites. These are designed to mirror trustworthy web pages, and users are fooled into giving away their username, password and even bank details. LifeTips is a Sight column for short tips that help make life easier. Do you have a tip or an idea that others could benefit from? Just add it on the Your Say at the bottom of the LifeTips page or simply send us an email to lifetips@sightmagazine.com.au. Both chicken satay and gado-gado are traditional Indonesian meals that I experienced when travelling there a couple of years ago. The satay are popular with tourists - immediately likeable, they are familiar chicken skewers often topped with a spicy peanut sauce. Gado-gado is a little different, but is a good option for vegetarians and tastes awesome. The salad is served cold atop cold or lukewarm potatoes, tofu and eggs, with the only heated ingredient being the sauce. The common use of peanut sauce makes partnering these dishes an obvious choice, and one that will leave your taste buds tingling for more! If I mention the word olive, does your mind turn to a particular paint colour, perhaps a dear old aunty who dates from the early 1900s or Popeye’s famous girlfriend “Olive Oil”? Or you might relate them to food, perhaps the ever present black olive on your weekend pizza. 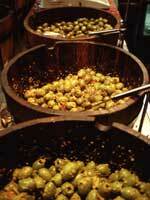 In this case, olives are a bit like anchovies: most people either love or hate them. Recent research is indicating that virgin olive oil is extremely good for your health and it is frequently listed in the “must have foods” section of many fat reduction and weight loss diets. The olive tree (Olea europaea) is also making a big comeback in Australian gardens. It's a new feature to add another dimension to your Sight experience. Sight Soundbites are small audio files that you can download to hear interview excerpts and our contributors talk on a range of subjects.